In December 1995 the Group of Seven Nations–comprising the United States, Canada, the United Kingdom, France, Germany, Italy, and Japan–(the G-7) and the Commission of the European Communities reached a Memorandum of Understanding with the Government of Ukraine on the subject of Chernobyl (in Ukrainian, Chornobyl). The agreement outlines a program of cooperation in support of the decision of the president of Ukraine to close the Chornobyl Nuclear Power Plant (CNPP) by the year 2000. Sections of the agreement deal with the restructuring of Ukraine’s electric power sector, investments in new energy generating facilities, and nuclear safety projects related to the Chornobyl site itself. One section of the agreement recognizes the implications of the closure of the CNPP for the workers and their families. It provides for the Commission of the European Communities and the Government of the United States to assist the Government of Ukraine with the development of an action plan for addressing the social impacts of the closure of Chornobyl. 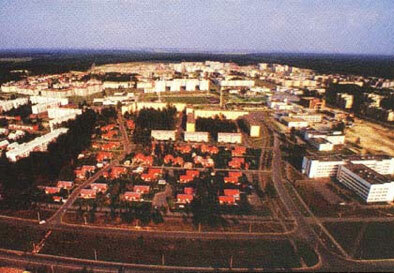 A joint working group was established to develop an action plan for delivering transition assistance to Chornobyl workers and community redevelopment assistance to the city of Slavutych, a city that houses most Chornobyl workers and is economically dependent upon the power plant. In support of the working group’s effort, the US Agency for International Development (USAID) funded a study tour to the United States through the New Independent States Exchanges and Training Project. The program was designed for USAID and conducted by Futurepast in August 1996. The following paragraphs outline the issues that members of the joint working group are considered as they developed an action plan during 1996. The city of Slavutych, with a population of about 27,000, depends heavily on the CNPP. About one-third of the city’s employed population works at the CNPP, and the CNPP and its workers generate much of the economic activity for the remainder of the city. CNPP also finances housing, education, communal services and health care for Slavutych. The planned closure of the remaining reactors at Chornobyl poses a number of socioeconomic challenges for Slavutych. For example, layoffs require consideration of compensation plans, provision of psychological support for laid-off workers and their families, retraining, and assistance in reemployment. As jobs are lost at CNPP, new jobs must be created in other sectors. A portion of CNPP workers may be retrained to participate in environmental remediation, but to provide sufficient employment, Slavutych will also need to diversify its economy and create a climate that will encourage the development of new businesses. Massive layoffs also create challenges for those who remain at CNPP. Consideration must be given to maintaining morale so as not to jeopardize safety at the plant. Open communication with workers is needed so that they will hold realistic expectations about how long they will retain their positions. Finally, job opportunities need to be created so that displaced workers may find reemployment when their assignments at CNPP are complete. The challenges that arise from CNPP closing are added to existing psychological stresses, health impacts, and social problems that are a continuing legacy of the 1986 accident. Functioning of private voluntary organizations and activity of citizen advocates for the health and welfare of their communities. Futurepast created opportunities for the Ukrainians to learn how these issues are addressed in the United States, and devoted time for discussion about which US approaches could be adapted to fit the Ukrainian context. In sessions with US Department of Energy and Department of Defense officials, Ukrainian participants were exposed to the views of national policymakers. Through site visits in Pennsylvania and Colorado, participants heard from state and local government officials, including industrial facility managers and community representatives, and saw community redevelopment programs put into practice. Because the Ukrainian delegation was large and diverse, Futurepast also arranged extracurricular meetings for individual participants to discuss topics of particular interest to them. The study tour provided by Futurepast helped the Ukrainian participants understand western countries’ approaches to social transition issues. Many of the final points in the action plan developed at the end of 1996 by the joint working group are inspired from models observed in the United States. Following an orientation session on their first day in the US, the Ukrainian delegation visits Capitol Hill and the Mall in Washington, DC. 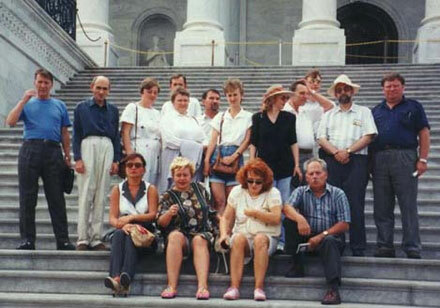 Futurepast’s John Shideler (in the Panama hat) poses with the group on the steps of the US Capitol.